On February 9th a news item was picked up by newspapers around the globe. It was the news that Marius, a sweet faced giraffe from the Copenhagen Zoo had been executed because his genes were already well represented at the zoo, thus making him unsuitable for breeding. Although the killing was totally unjustifiable, it has to be said that he was killed in a relatively pain-free manner. Shot in the forehead with a bolt gun as he put his head forward to eat his favorite rye bread, he would likely have suffered very little. Nevertheless, public outrage rightly ensued because this beautiful and inoffensive creature had been needlessly robbed of his life. On February 20th another animal story was in the news, but this time, very few newspapers picked it up.This one wasn't reported as an animal story as such, but rather, a medical "step forward". Neuroscientists working on a paralysis cure at Boston's Harvard Medical School had connected the brain of a monkey to the spinal cord of another via a computer that decoded and relayed the neural signals. The first monkey, dubbed the “master”, was placed in a special chair before a computer screen that showed a cursor and a green circle that alternated between two spots. The monkey’s head was restrained. As the master thought of moving the cursor, his brain signals were decoded to determine which of the two targets he had in mind, and the data was relayed in real-time to the spinal cord of the unconscious monkey, whose arm manipulated the joystick accordingly. 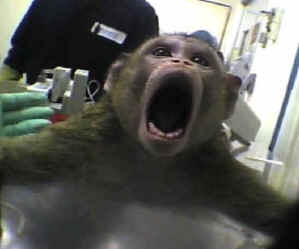 How much suffering would these pitiful monkeys have endured before reaching this stage of the experiment? Permanently housed in wire cages inside grim, barren cells they would never have known anything resembling a normal life. Although primates are known to be extremely social animals, up to 35% of them are kept socially isolated in these institutions. And then there would be the fear and pain of the operations. unsuccessfully transplanting pig kidneys and hearts into baboons and exposing primates to aerial predators (raptors) to study their distress calls. If there was worldwide outrage over the near painless killing of one giraffe, surely there should be 1,000 times the outrage over the monstrous torture of these other "born to be wild" animals. No perceived benefit to humans can ever justify this cruelty, particularly since primates share 93% of our human DNA (genes). The monkeys in last week's paralysis experiment may not have been killed, as was Marius, but sometimes living can be worse than dying - and in their case, I'd say it definitely would be. Jenny Moxham is an animal rights campaigner from Monbulk, Victoria.